Enjoy a priceless, once-in-a-lifetime experience in South Africa, courtesy of long-time NWWF supporters and Past Honored Vintners, Shari & Garen Staglin, along with American winemaking legend Zelma Long and South African vintner Mike Ratcliffe. After your overnight flight from New York, check into your one-bedroom suites at the newest and most luxurious hotel in South Africa, the One&Only. Situated in the heart of the Cape Town waterfront, it is surrounded by all the energy and activity that has made Cape Town a true must-see destination. After you relax from your flight or take a quick stroll, get ready for a fabulous dinner at Chef Gordon Ramsay’s chic new restaurant, Maze...his first in Africa. Each morning, you will be greeted by your own personal tour guide and driver who will take you on a full day of touring. Over the next few days you will experience Cape Town at its most exciting. First stop? The top of famous Table Mountain; where you can see the city, the harbor and the entire peninsula down to Cape Point. Your guide will also take you to all the top tourist destinations including, the National Gallery, the South African Museum, the Houses of Parliament, the penguin colony in Simonstown and a glass bottom boat to the seal colony. You’ll even take a drive down the coast to the fishing hamlet of Kalk Bay and its many antique shops, continuing down to the Cape of Good Hope. As you stand on the most south westerly point of Southern Africa, you will see some of the most dramatic landscapes on the planet. 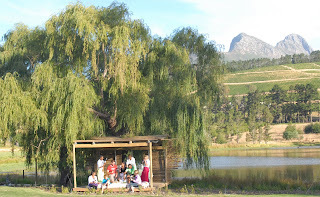 Today, your guide will take you through the Elgin wine and fruit growing region on your way to Hermanus; a charming coastal town set between mountains and the Atlantic Ocean. Nature lovers from all over the world come here to watch the Southern Right Whale from these cliffs. Several of the country’s top wine estates are also nearby and at South Africa’s premier Pinot Noir producer Hamilton Russel Vineyards, you’ll be hosted by proprietor Anthony Hamilton Russel for an in-depth tour and barrel tasting. Upon your return to One&Only, dinner will be waiting at Chef Nobu Matsuhisa’s African version of his acclaimed eponymous restaurant, Nobu. Once you have been bewitched by the majesty of Cape Town, you will be whisked the short distance to the South African wine lands where you will reside in luxury and be personally escorted through this spectacular wine region. Your home these next two nights - the Owner’s Cottage at Grande Provence, named by Harper’s Bazaar as one of the “10 Most Fabulous Villas in the World.” The property is a 300-year old wine and fruit estate nestled in the magnificent Franschhoek Valley. Dine at the Grand Provence Restaurant and visit the cellar where years of great winemaking heritage comes to life. That morning, your driver will take you to the Vilafonté Vineyard in Stellenbosch where you’ll meet South African Mike Ratcliffe and Californian Zelma Long, partners in the world’s only South African–American luxury winemaking joint venture. Vilafonté is the only South African winery to have been nominated by The Wine Enthusiast for ‘New World Winery of the Year.’ You’ll experience a vertical tasting of the Vilafonté Series M and Series C wines and learn about the most cutting-edge developments in South African winemaking. 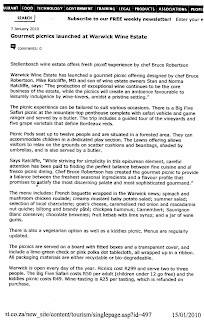 Lunch with the Vilafonté team at the winery’s Italian bistro, Pane e Vino and after a rest in their guest house, Mike and his wife Pip will host a traditional South African braai (barbecue) at Warwick Wine Estate, their family-owned winery. Significant milestone wines from the past 40 years will be opened to celebrate the evening. Return to Grande Provence for one last night. After a fond farewell to the luxurious Grande Provence, you will be off to your next adventure! Fly to Singita Sweni; the most intimate of the renowned Singita lodges. Set amidst the foliage of the Sweni River in the Kruger National Park game reserve, there are just six riverside suites, with floor-to-ceiling windows, luxurious bathrooms and an expansive living area. A private deck over the water’s edge is an idyllic spot for drinks or to curl up with a book. A typical day at Singita starts as guests congregate with the rangers at the main lodge for tea, coffee and light snacks in anticipation of the early morning game drive. Who knows what to expect? Maybe a leopard in the branches of a tree with a kill, a herd of elephants, or an impala may dart right in front of your Land Rover. A spectacular breakfast will follow your return. Spend the morning indulging in a massage or beauty treatment at the spa, shopping or simply relaxing on your sundeck. 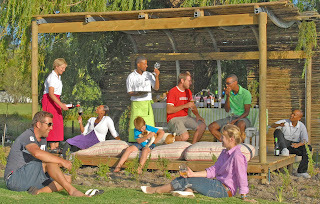 After lunch, take a walking safari, followed by afternoon refreshments in the main lodge. The exciting evening drive is the apex of your African adventure. Imagine watching the sun set over the horizon while you witness a pride of lions stalking their prey or buffalo strolling to a water hole…each an unforgettable wildlife experience. Upon your return, the fires are lit and the night's entertainment begins. Have dinner around the fire in the Boma under the stars or a gourmet meal by candlelight in the dining room. Then…retire to your suite for a restful night’s sleep in preparation for the next exciting day! Upon your return home and into reality, the crème de la crème of wines from Staglin Family Vineyard, Vilafonté and Warwick Estate, presented in a keepsake box, will be a wonderful reminder of this dream of a trip. Yes…dream of Africa...but with one magnanimous bid…live your dream. Insider's Info: Trip to be taken on mutually agreeable dates March 1–December 1, 2010, excluding June 1-30, 2010 during the FIFA World Cup. All airfare and ground transportation within South Africa are included. Flights within South Africa will be a combination of commercial and charter. All breakfasts at all accommodations are included. At One&Only, dinner at Nobu and dinner at Maze are included. At Grande Provence, dinner is included, as well as the lunch and dinner with Mike Ratcliffe. At Singita, all meals, two daily game drives, walking safaris and premium wines & spirits are included. Additional meals and activities outside of those listed are not included. 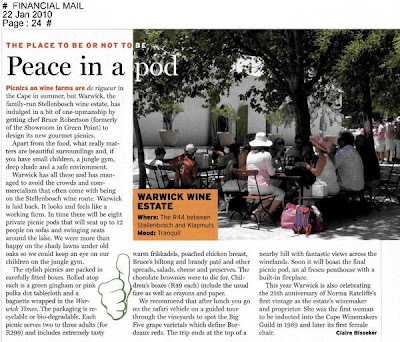 Dear Boozy Bloggers, wine lovers & amateur wine writers, It has been almost 2 years since our last ‘Bloggers braai’. A few of us locals felt that it was time to start the ball rolling again in 2010 – and keep it going. Please join us for the second annual (yes, annual) ‘Bloggers Picnic’.